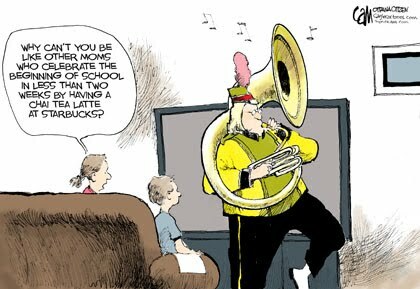 Yep, for parents it's the most wonderful time of the year. 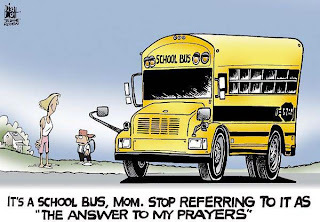 Here's a few editorial cartoons on the same subject that hopefully you'll also get a chuckle out of. Ha, ha! That commercial was (and still is), priceless! 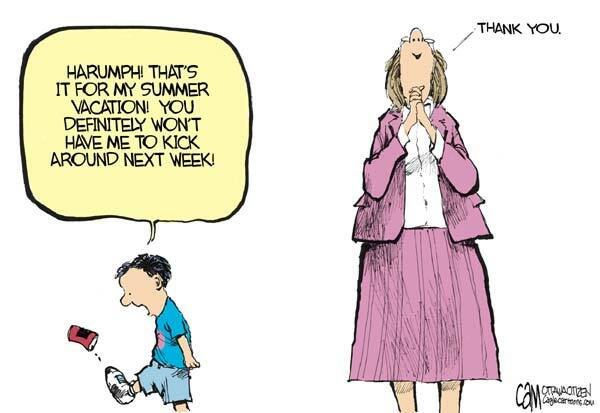 I'm sure you appreciated your kids going back to school, maybe not as enthusiastically. 00dozo: For me that commercial is priceless. It's something I'd have done - you know, rub my kid's noses in it. Ziva: A-ha-ha-ha, that's hilarious. With a sense of humour like that you could go to work in the advertising industry and write some of those funny commercials. And soooo true! At least they are for me! I totally loved the School Zone Watch Out For Kids And Moms Too! 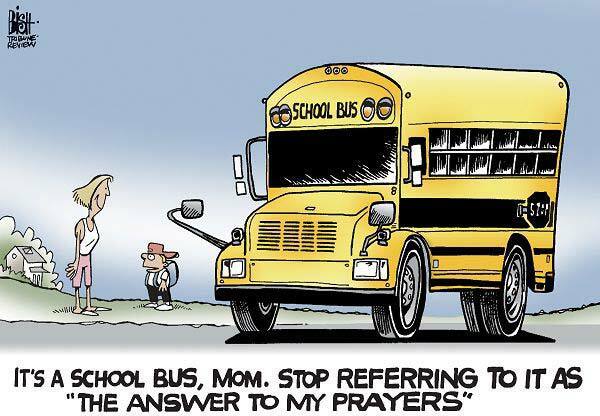 And yes, school buses are answers to prayers! Quirks: Glad you enjoyed them. I started collecting them a couple of weeks ago. 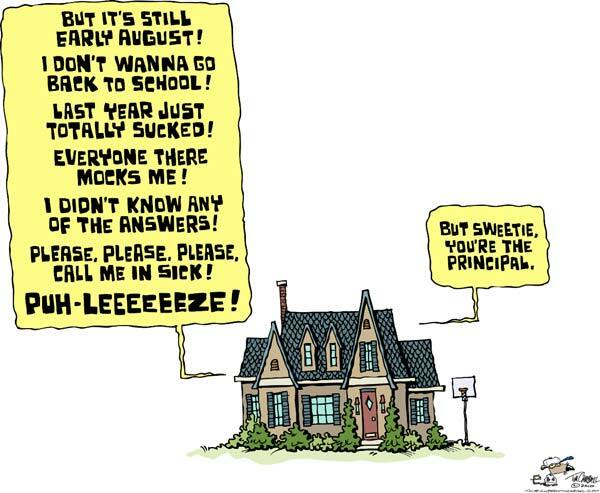 I love the "but sweetie you're the principal" one. 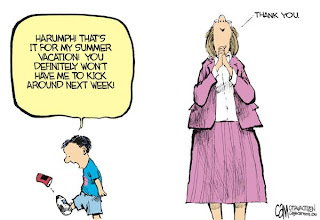 Guess the kids aren't the only ones not looking forward to going back. I'm doing a musical tribute to back to school over on dufusdownbeat next week. You should drop by. My first born spawn starts college on Monday and his little sister starts her sophomore year on Wednesday. Who's counting down the days? That'd be ME. Except that I won't be able to sleep in anymore but it's a small price to pay for Peace and Quiet. Leeuna: Isn't it great. The commercial, I mean. Well and the fact those little ankle biters will be someone else's concern all day long. Kelly: Yeah, now you'll be able to devote more time to stalking that hockey player. Good for you! I've been counting down the minutes since mid July. I can't wait, and only 9 more days! Jen: Since mid-July? You poor soul. Well, not much longer. Hang in there, Jen. I always loved that commercial! I think my kids are weird. They're actually looking forward to starting back to school. I'm sure it won't last long. Great commercial and I loved , loved the cartoons...mine are 18 and 21...but I feel the same way....maybe even more...I love them around but I really love the house staying clean, no dishes in the sink...and PEACE and Quiet...and blissful time with me and the Hubs..!thanks for the chuckle..! Nicky: As a kid I always found summer vacation long and looked forward to going back. As I got older, I got wiser. Laffylady: Yeah, I know the feeling. It's great to have the kids around. But it's also nice to have some time for yourself That's why they call it "the most wonderful time...". Glad you got a chuckle out of this. I thought that commercial was funny even before I had the kid; now I find it funny... because it's true. Except mine's going to kindergarten, so she really doesn't know what her life is to become. (Nor do I, really, but at least I won't have to fight for my computer or play "Snakes" and Ladders for a while.) Cartoons were great, too. And that's just a couple of weeks worth? Maybe next year you should sell them at school bus stops? Can you imagine the mortified kids? KABLOOEY: Your child's probably pretty excited about going to school this year. That could change in years to come! One of the BEST commercials, ever! 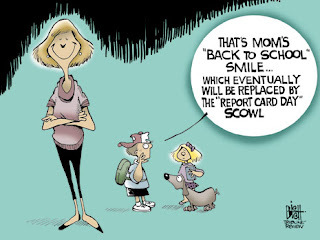 Back to school brings out emotions in all of us... some happy, some tragic! CL: Don't you just love that ad? Well, it's been some time since I've gone to school. 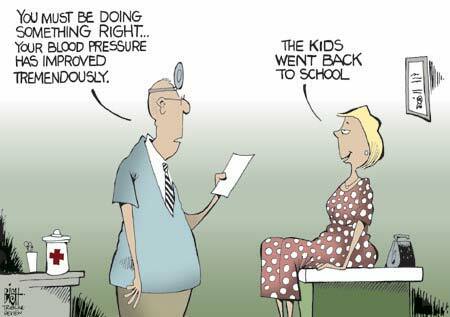 And my kids have been out in the working world for some time. But my eldest grandchild starts Jr kindergarten this year. So the circle is unbroken.